Presidential debates are often more about how candidates 'look' on the screen, than on what they say. Even more than newspaper photographs, the television screen distinguishes firmly - and often cruelly - between the telegenic and the rest. And one of the novelties of the 1960 Presidential campaign was the introduction to a newly televised public of polite, staged exchanges between the nominees. On the left is John F. Kennedy, 'JFK' and on the right is Richard M. Nixon, 'Tricky Dickie', as he was unkindly later known. The scene is the CBS studios in Chicago and the date is September 26, 1960. The first thing that is striking about this image is how homely it all is - truly the CBS studio could be, if not someone's front room, certainly the seminar at the local college - and the whole effect is refreshingly amateurish, with the debate moderator's feet poking out from underneath the flap of his desk. Indeed 'Tricky Dicky' looks awkward and uncomfortable, squirming in his seat, while JFK seems much more at home. It's a homely feature too that everyone is sitting - rather than standing behind lecterns - as this immediately changes the tone of a debate, rendering the human animal less aggressive and more consensual. The election was very close but likely the TV appearance favored Kennedy who became the nation's youngest President and first Catholic ever elected to the office. Today's TV studio’s are all about technological sophistication and electronic screens are likely the background. The more spectacular, the better. A lot of distraction. At least here, in this sepia image, the human being is shown as such, no fancy tricks in that regard. But of course, the real tricks are weaved psychologically, then and now. Did, in those days, to see the future president in this setting, make them seem closer to ‘normal’ people in a certain way - or even more exceptional? 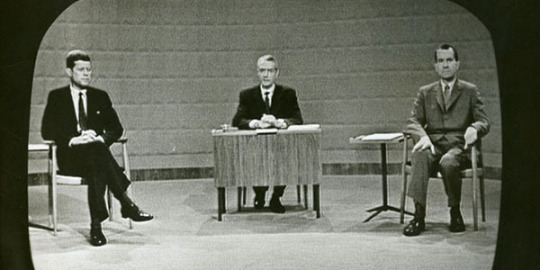 The 1960 televised debate — the first of four in a series — underscored the importance of appearance (the optics) in this visual medium; the photo posted above does the same. But there’s more to it, worth telling. Naively, and likely out of ill-conceived bravado, Nixon initially chose not to allow stage makeup for himself, his being told that Kennedy had refused makeup. It turned out Kennedy did indeed (wisely) use the stage makeup, which, along with a recent tan, made him look fit. Meanwhile, Nixon’s handlers applied crude pancake makeup, which didn’t hold up under the lights, causing him to be seen sweating profusely. The result was Nixon continually mopping his face (especially upper lip) with a handkerchief. It was not a pretty picture. To the point of the image above, it differed in polls between the TV audience and the radio audience as to who won or lost the debate. Those who only listened to the debate on the radio, and thus didn’t see Nixon’s uneasiness, thought either that the debate was a draw or that Nixon won — their concluding that Nixon presented the more informed policy arguments. Those who watched the debate on TV, however, witnessed Nixon’s discomfort — sweating, squirming, side-to-side shifting of eyes — concluding that Kennedy had won the debate. Apparently, candidate Nixon’s awkwardness before the cameras outdid the soundness of substance. A little more background is in order: Kennedy took the day to prepare for the debate, rehearsing answers to anticipated questions; Nixon, despite not feeling well, spent the day on an exhausting schedule of campaign appearances. Calamitous strategizing, but the result undoubtedly further influenced perception. Fast-forward to the recent Trump-Clinton debates in the general election, half a century later. The debate where candidate Trump famously loomed overly close behind candidate Clinton, during her turn to respond to a question, jumps out as especially emblematic and problematic. As Clinton tried to make eye contact with a nearby section of the debate audience, Trump appeared menacing, looking downward at a seemingly dwarfed Clinton — unwittingly made all the more dramatic by the camera angle. Thinking back to that scene, one might reasonably conclude, fifty-plus years after the Kennedy-Nixon debate, that the optics, including the stage management, of presidential debates still matter to outcomes. Meanwhile, presidential electioneering has morphed increasingly into gladiatorial tournaments, televised for roaring supporters and disparagers — voyeurs both — safely ensconced at home. The image here shows the TV debate venue as politicians’ modern-day coliseum — a ‘bread and circuses’ metaphor. Thank you, Keith, for this very appropriate tour of these 'unintended' images from political TV. I had heard many times of the Nixon 'sweating' issue - but the details are new to me and fascinating. (On TV it's not what you say, but how you look as you say it!) As to Trump, yes, this is the comparison - and yet his boorish, threatening, even 'sulky' appearence seems to have chimed with a certain strand of disafffected white, male, working class America - so what one viewer gets from it is not what another may. In an image one finds what one is looking for? A lot of images are used for propaganda, a sign of our manipulative nature? Where does this leave the image? The political analyst Bruce DuMont said, 'After that debate, it was not just what you said in a campaign that was important, but how you looked saying it.' One sees it in the photo. One might ask how much words then say, and what their limits are. On the other hand, most politicians force their way to the top 'off camera', as it were, and then only have to be more convincing/ photogenic than their rival. Surely the great novelty with Kennedy was his boyish good looks - just right for the new television age - versus Nixon's tweedy professor style that looks so uncomfortable and out of place.